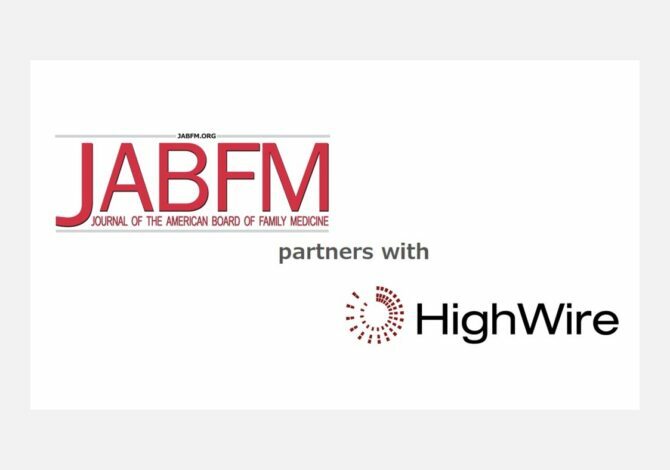 FEBRUARY 05 2019, LOS GATOS – Scholarly publishing tech provider, HighWire, today announced the Journal of the American Board of Family Medicine (JABFM) is using JCore to improve user experience and increase self-administration capabilities on its site. Part of the HighWire Hosting solution, JCore provides powerful content ingestion, enrichment and publishing infrastructure for journal websites. Using in-depth clinician and researcher interviews, its architecture was developed to provide exactly what users most value: an uncluttered view, with the most useful content available in as few clicks as possible. HighWire Hosting gives JABFM a modern site design that can be strategically configured in support of publishing goals and delivers a quick and simple solution to highlight content, enable advertising and change menu items and text snippets. Published since 1988, JABFM is the official peer-reviewed journal of the American Board of Family Medicine (ABFM). Believing that the public and scientific communities are best served by open access to information, JABFM makes its articles available free of charge and without registration at www.jabfm.org. JABFM is indexed by Medline, Index Medicus and other services. JABFM has had a great working relationship with HighWire for many years. We knew HighWire could continue to provide the technology that keeps our site at the forefront of new knowledge for the understanding and advancement of family medicine research and clinical practice. We’re very pleased to expand and continue our partnership. JABFM is an influential open access medical publisher and we’re proud to partner with them. This is another example of our continued commitment to supporting open access publishing.